Google Wave is a social communication sharing and interaction platform. But it is difficult to explain precisely, without either getting too technical or making it sound a lot like something that already exists. Yet, a lot of people are excited for a good reason – which is about the future of internet-based collaborative communication. In essence, Google Wave is equal parts a technology and a vision, which can enable an even more interconnected experience for friends, a more open and collaborative way ahead for the knowledge-based future of business, and a multi-user environment for developers of hosted applications and games. As a technology, much of ‘what it is’ is highly specialist. Under the simple interface is an extremely sophisticated and detailed synchronisation infrastructure, with version control, instant messaging, online document sharing, custom gadgets, buddy lists and real-time conversations. And as with other Google apps, like Google Docs or Google Mail, it is a hosted service, which holds all user and document data online – making the waves available to any machine or device that logs on via a modern browser. What is new and unique about Google Wave, and what’s not been done before because of the mind-boggling level of complexity to keep all of the changes in step in real time, is the creation of the Google Wave Federation Protocol and the Extensible Messaging and Presence Protocol. If you imagine any number of people in any number of locations, connected to any number of wave servers, making any number of simultaneous edits or additions at any place within any document or custom gadget, and able to look back to any previous moment-by-moment version, you can imagine the order of magnitude this complexity computes to. 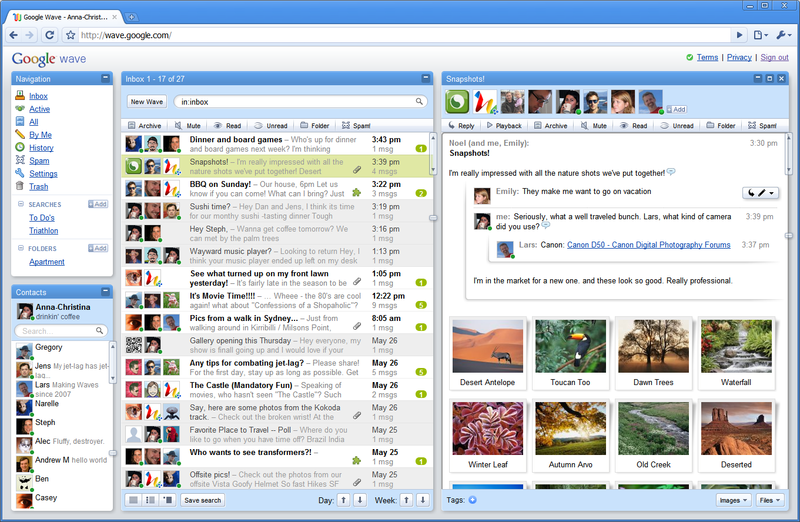 Google Wave doesn’t only run as an application with its own interface and tools. A wave can add its collaborative communication method into blogs, or other websites to replace the postings there, turning them into more instantaneous living feedback environments. And as an open source code project, any business who wishes to install their own corporate, firewall-protected wave servers for internal collaborative communications can do so. As a vision, and the best way to start thinking about Google Wave’s potential, is how its creators first did – with a determination that email is an old form of communication, increasingly out of step with the social media revolution and its methods of collaborative interaction. Personal and business use of Facebook, LinkedIn, Google Docs, Twitter, Skype and Yammer reveal this insight every day, in that email has become one of many mediums which serve specific communication problems. On an email, by the time the CC and Fwd chain has extended to a group, and the reply quotes are 10 deep, the communication model it is based on starts to break apart. Email is not a great collaborative and extensible workflow process tool – but Google Wave can be. Google describes it as “equal parts conversation and document”, and as being a “new model for communication and collaboration on the web” – so it enables any number of people to come together, as a group, on instant messages (IM), documents, email-type messages, and other social media in real time, through any modern browser-enabled device. It is a fluid multi-user, overlapping communication medium. But it doesn’t stop there, Google Wave can also be integrated into corporate environments, websites, extranets, and have custom created gadget applications dropped into waves. The Google Wave vision is actually in step with an emergent shift in authorship and document ownership, which will bring about a new way of thinking about collaborative communication. This will align very well with current trends in the business world. 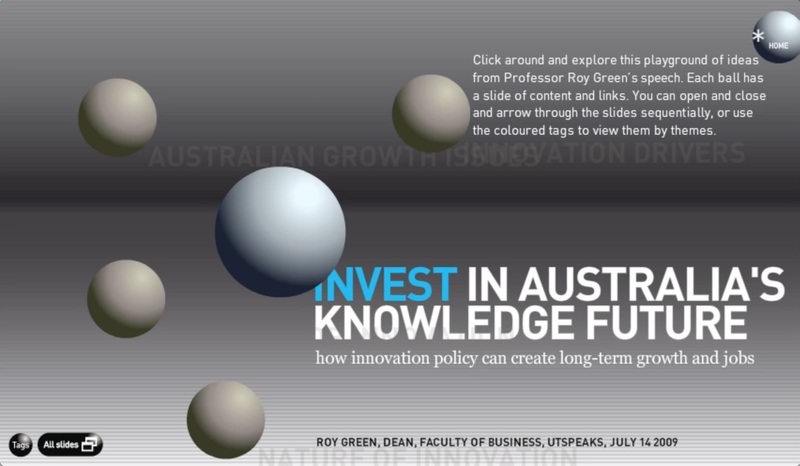 Knowledge capital and the harnessing of collective intelligence, even across different geographies, has been a growth area for many years. Corporate extranets, hosted web services, online meeting tools, and strong search and categorisation tools – to bring corporate intelligence to the surface and into workflows quickly – have been a mainstay of IT departments for a decade. As with other social software environments, it will be the huge global developer base, creating their own applications to run within Google Wave that will help revolutionise the potential of this technology. Games, spell-checkers, real-time translation engines, mapping, location-aware collaborative shopping, and other as yet unforeseeable solutions will emerge. Even before Google Wave is out of preview release, companies such as SAP, Salesforce.com and Mingle are developing workflow Gadgets that link into their own products and services. For SAP that means collaborative business process modelling between people across several company divisions with distinct yet specialist knowledge, to reach a mutually diagrammed and signed off solution. For Mingle, Google Wave offers the next level of participation for their project management solution. And to take the group communication up one notch further, Google have also announced their purchase of Gizmo5. This will add a VoIP service with landline and mobile gateway, to rival Skype, into the braided world of waves. With collaboration, also comes complexity, and new data management and communication challenges and opportunities. Assistive ‘robots’ already manage and redirect customer service traffic for our telephone equiries. These robots can be dropped into waves to perform the same kinds of assistance online, redirecting unresolved issues to humans – which is what Salesforce.com have now created. Other robots available now include real-time translation engines and highly context-aware spell-checkers. As more businesses and application developers see the opportunities that collaborative communication can offer, we will see a rise in assistive robots in our everyday lives. The emergence of Google Wave may well become one of the prime change agents for this emergent trend.